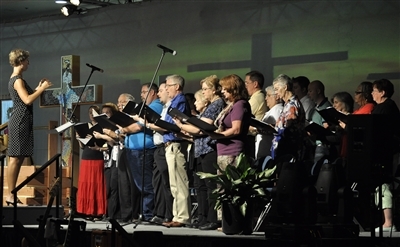 Dr. Beth Gibbs of Florida Southern College, left, directs a volunteer choir assembled at Annual Conference 2014 to perform at the Service of Remembrance. Photos by Steve Wilkinson. LAKELAND -- As each name was read, a candle was lit and people rose from various places throughout the hall to honor the person who had touched their life in a special way. 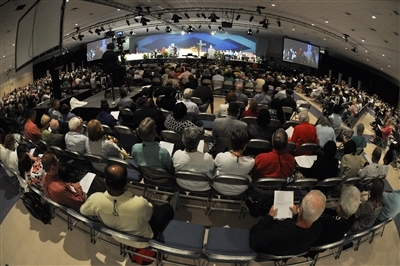 The dignified ceremony to mark the service of those who have died in the last year was part of the Florida Annual Conference Service of Remembrance held Friday morning at The Lakeland Center. “They were the light of the world. They made a difference,” said Rev. Pam Cahoon during her reflections at the service. “We cannot imagine how many people’s lives have been touched, changed, healed and made whole as a result of our loved ones,” said Cahoon, who recently retired as executive director of CROS Ministries in Lake Worth. “They have supported missionaries. They have led work teams. They have cared for the homeless. They have supported food drives. They have been involved in immigrants’ lives. "They were the light of the world," Rev. 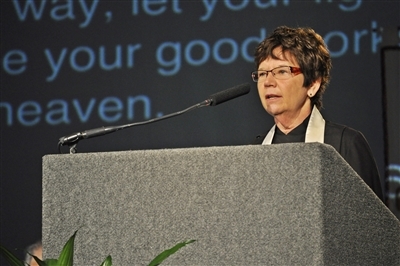 Pam Cahoon, above, tells an audience at The Lakeland Center. Those being honored included Bishop James Lloyd Knox, who was from Tampa and served as bishop in Birmingham and Atlanta before retiring in 1996. The ceremony also paid tribute to 30 clergy members, one diaconal minister and 23 spouses who have died during the past year. Cahoon made it a point to recognize the many sacrifices that the spouses of clergy make – including putting their careers second, moving away from friends and attending countless church suppers. Music for the service was provided by a volunteer choir, made up of conference attendees who stepped forward earlier in the week to share their vocal gifts. They were led by Dr. Beth Gibbs, director of choral studies at Florida Southern College. During her remarks, Cahoon acknowledged the pain that accompanies the loss of a loved one. “Our grief oftentimes overshadows the light, and that is just the way it is,” Cahoon said.